I found this great idea on Pinterest and decided that I could totally DIY the heck out of some bean bags. So, I dug into the deep dark cavern that is the back of my cupboard and pulled out some old pairs of jeans that have probably not been worn since 2012BK (before kids). I decided to change up the original idea that I saw on the Pinterest link and used what I already had around the house to make a few bean bags for Paige (and James when he is bigger of course – if they survive…I mean the bean bags, not the kids). 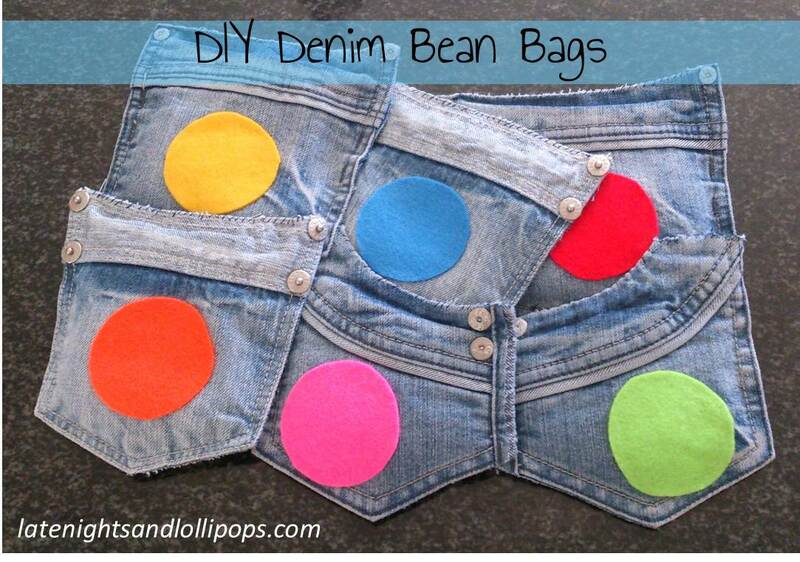 old denim items with pockets (pants/shorts/skirts etc) – the number of bean bags you can make will depend on how many denim items you have lying around that you don’t mind chopping to pieces. I cut up 2 pairs of denims and was able to get 6 pockets because one of the pairs had denim lining the front pockets too, instead of the usual flimsy fabric inner. push a small sandwich bag into the pocket and then fill it about half to three quarters with your filling of choice – I used rice because that is what I had in the kitchen cupboard. put the filled sandwich bag back into the pocket and use your needle and thread to hand stitch the top of the pocket closed – I doubled the thread for added strength and kept the stitches tight and close together – knot the end and cut off excess. Presto – you are done. 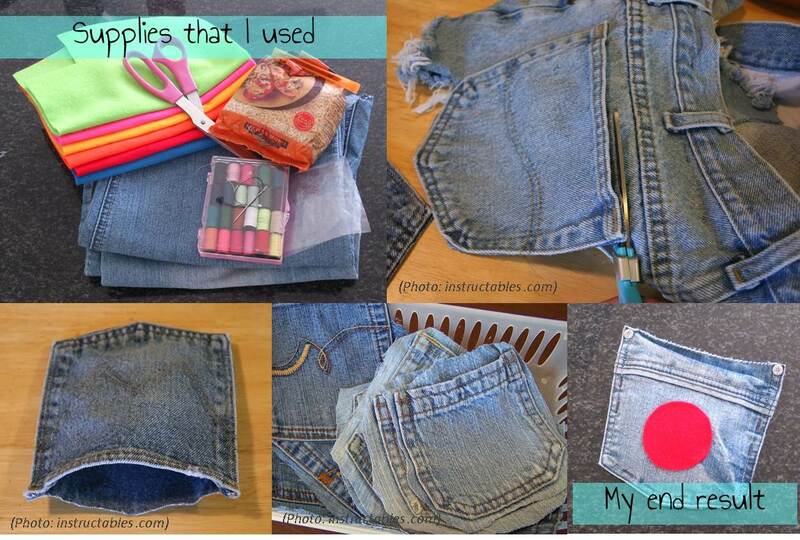 Note: I kept the extra denim pieces for future craft missions. balancing bean bags on her head while walking – this has been a fail so far because she always tries to look up at the bean bag. throwing the bean bags into a basket placed a metre or so away from her – she likes this one and is actually quite good at it. I am definitely going to make more bean bags at some stage – more colours, shapes etc – but i just need to convince my friends and family that denim is so last season and they should give theirs to me to chop up. If you decide to make some then please share pics or just tell me about what you did in the comments section. I would love to know how you made them your own and what activities you and your kids use them for. 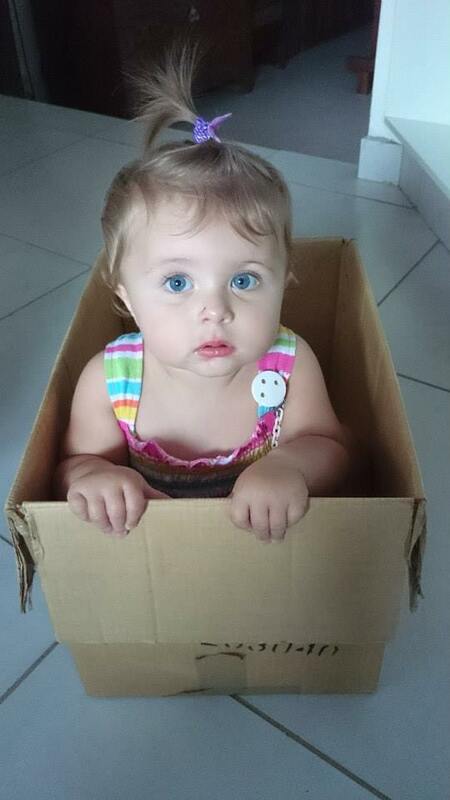 I don’t think that there is a mom out there, in this big wide world, that does not understand the value of a box. Yes, I said a BOX. You know, usually brown, fairly strong cardboard, cut out and folded and stuck together to make a square or rectangular structure – commonly used to move house, carry groceries and store ‘stuff’ in the garage rafters that we no longer need or use but just can’t part with. 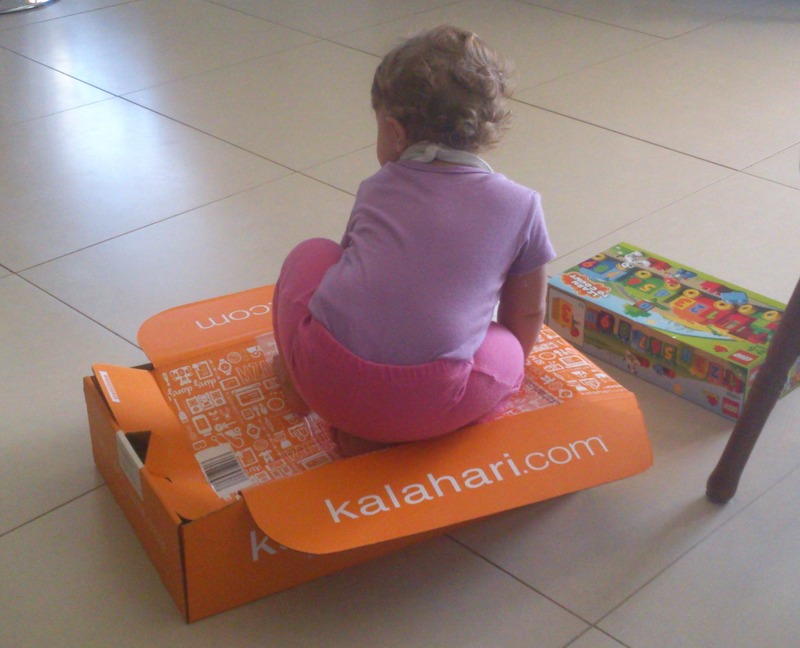 A box to a kid, I would say, is like honey to a Pooh Bear – they just can’t walk past one without getting stuck in. And who can blame them, I mean, they are quite exciting. If big enough then you can climb into it, or turn it upside down and sit on top of it, or if you sit on the floor then mom or dad can cover you with it (a cut out window makes this a winner), and you can even turn it sideways and sit inside it like Pooh Bear would sit in his little house. If my daughter receives a gift, and it is in a reasonably sized box, then please don’t take it personally but the gift inside is most definitely a second runner-up to that glorious box that it came in. She will eventually drool all over the box so much that it will become a soggy mess, and we will have to take it away and chuck it into the bin, which will most likely lead to tears and a tantrum. BUT THEN we will wave the actual gift in front of her – and that’s when the runner-up will become the new prize. That’s just the way it is…sorry. which is getting more attention?